They put the rest of us to shame. 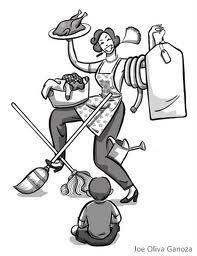 They put a capital M in Mother, as Mothering is their job. Sometimes it extends even further into all-organic, all-cotton, all home-made delirium. And that is fine, as long as you don't look down on the rest of us human-type-people who have other things to do and pressures to face. Additionally, you need to see that line where your kid might prefer you to back off a bit. Don't you need an life too? I know I do!